An involuntary full body stretch woke me up to the fact that the pain and instability I had dealt with since my fall on Wednesday had diminished. Upon further inspection, the kneecap was tender to the touch, but that wasn't enough to stop me from joining the group for the 30th Anniversary of the Mt. Masochist 50 miler! Yahoo! At least I could start and see how things went. Our small group of girls made our way to the start area and huddled in the car in-between porta-potty stops while waiting for the final minute to strip off the down sweater and head to the start line. I met up with the Patagonia crew as we lined up and took the opportunity to snag a photo. In the race's 29 year history the course has remained the same (as much as a trail race can). For the 30th running, due some permitting issues the race organization took the opportunity to delete a majority of the early paved road miles and put us on trail. Awesome improvement! 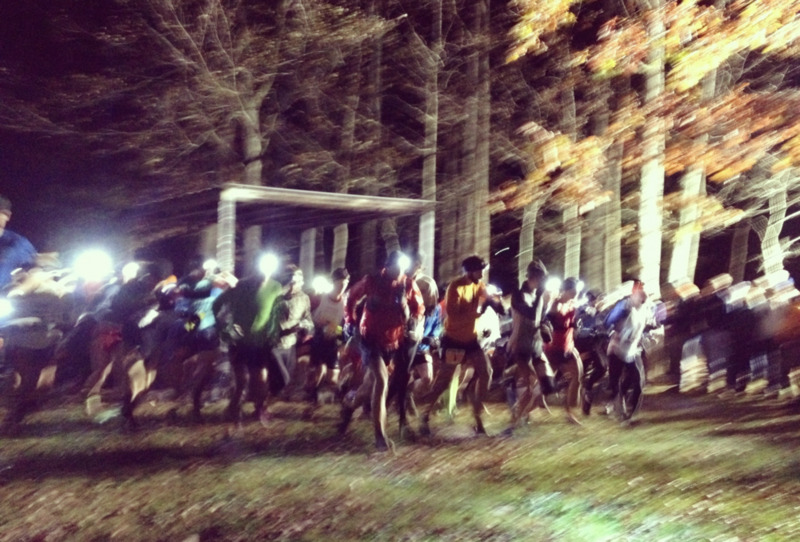 The necessary headlamps lit the way for the first hour of the race where we rejoined the route and carried on. I got to run stride for stride with Alyssa for a mile or two and we chattered along about Africa, and her recent cool work opportunity. Right about mile 2 there are two feet soaking water crossings. I took my time to get across hoping to avoid another fall and Alyssa splashed right through and was gone. A couple of overseas triggered bathroom stops and an overwhelming urge to lay down and sleep (jet lag) added interesting challenges to the day and I found myself having to focus to stay awake and move forward. With the nature of the course and the long double-track sections that allow you to see your path for a ways to come, I found that I could see Alyssa for most of the first half of the race when we came to a long straight-away, but I could not make up any ground. Thankfully I had remembered to charge my Shuffle and the combination of music and caffeine did the trick to keep me moving. I found myself thinking, "don't give up, you never know what will happen." Alyssa ran a super strong and extremely smart race. At the halfway point she disappeared and even on the long straight-aways she was out of sight. The day was weird in the sleepiness that I felt, but also strange in the strength I found in spite of it. We were through the halfway point at least 15 minutes faster than I have ever been through before, I was running climbs that I normally power hike and a steady rhythm continued, even when my mind thought otherwise. The multi-day running has an amazing impact on building strength and improving recovery. The body learns quickly that it better repair because there will be more tomorrow. I can't help but think the huge improvements I saw in my knee each day and then finding this strength when I should be completely wiped from all of the travel were both benefits from the stage run. Additionally, it was a very solo race in that I spent most of the day alone and in my own head. After 8 days running around Kilimanjaro with a group of guys chattering and experiencing the Tanzania countryside the quiet was a bit foreign. Just keep moving. Another first in the race's history was the significant amount of snow on the second half of the course. After we climbed out of the halfway point of Long Mountain Way Side the white stuff on the side of the double track started to show, then increase and then after about mile 30 we were in 6inches to 3 ft (due to drifts) of snow for the remainder of the run. The 15 or so people ahead of me made all the difference as they did the hard work of breaking trail for the rest of us. The snow was beautiful and the sunny, clear day made it feel as if we'd transported from fall to winter in less than an hour. It was incredible. Perhaps the best known section of the second half of the Mt. Masochist 50 is "the loop". A roughly 4 mile loop of technical trail that comes at you around mile 33. This year the loop included an additional out and back to the summit of Mt. Pleasant making it a little longer than five miles. On the out and back we were able to see a bit of the rest of the field and it was nice to get out of my own head and cheer on other runners. The top 4 women were all really close which served as good incentive to just keep moving. The familiarity of the course was a nice benefit, I haven't run Masochist in at least 5 years, but I found myself able to see what was next and knew when to push and when to chill. When we came into the last aid station which marks 4 miles to go the crew told me that Alyssa was maybe a minute ahead, which coming out of the loop they told me she was seven minutes ahead. I first wondered if something was wrong and then questioned my next move. My pace had stayed steady for most of the race, but with 4 miles downhill to go I knew my body would "smell the barn" and as long as I kept powering down the calories the finish would come quick. It was Alyssa's 10th Masochist finish and I guessed from how she had looked back for me each time there was a straight-away in the first half of the race that the win was something she really wanted. She'd run strong and super smart all day, putting time on me and running her race. Should I back off the pace a bit and cruise in? The thought crossed my mind more than once and even after the race when I was talking with friends (mostly guys) they couldn't believe that I even questioned it. I will give credit to my bud and Western States pacer Justin for his quote that rang through all the way to Virginia and motivated me to run my race and to race. "Close the door." I couldn't see Alyssa ahead even though there were some long switch-backs. I did see someone on a bike, but he quickly disappeared down the hill. With all the snow I focused on my feet and turnover. After crossing a rocky creek bed I glanced up and saw Alyssa's white shirt a few hundred yards ahead of me... just keep moving. Close the door. I picked up speed after the tricky footing and Alyssa moved closer and closer. The intersection leading to the Fish Hatchery was just ahead and as I moved by I said something about her great race, but kept pace and even accelerated as the road pitched steeply downhill and I let everything go. I saw Horton changing out of his bike clothes as I made the bend and he made some sissy girl comment before I was out of earshot. :) Only a minute or two later I came across the "1 mile to go" mark and looked at my watch - 8:35 and change. Just keep moving. A left hand turn on the road to Montbello and the sight of the finish line came into view and Clark and Horton were waiting on the other-side to great me. 8:41 and change. The speedy last mile took my breath away and I stood there with hands on knees gasping trying to get everything back under control. Just keep moving, you never know what will happen. Alyssa finished just two minutes later and I was there to give her a hug. All of my thoughts and worries about stealing her finish were present, and it wasn't much later that we were able to chat. Perhaps one of the best compliments I have ever received came from her in those minutes after we finished. "I wasn't just beat by anyone, it was okay to be beat by you." George and Mark feed hungry runners... perhaps 400 quesadillas alone were prepared within feet of the finish line. The finish line of most ultras is probably one of the most fun places to hang out and the 30th time for the Masochist was no exception. 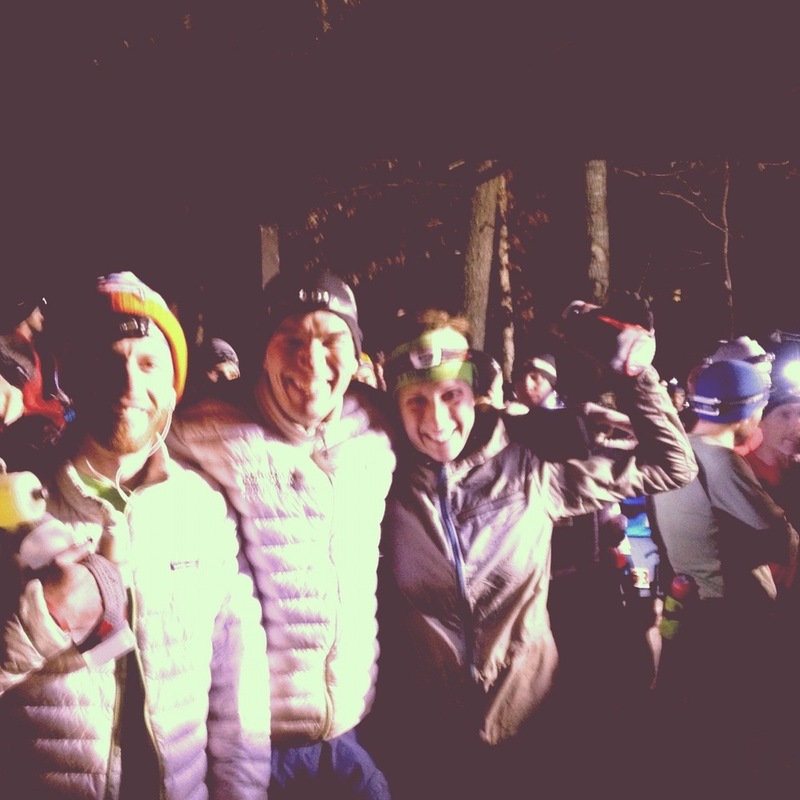 After changing clothes and indulging in the tomato soup and turkey/cheese quesadillas prepared on the spot by the Patagonia guys we continued cheering runners through well after dark. Due to the snow, Clark made the decision to extend the cutoff from 12 hours to 12 and a half. The last 30 minutes of that race were the best I have witnessed and cheered for, perhaps ever! In those 30 minutes 53 runners crossed the finish line. I wandered back out on the road to cheer runners in and loved each one's effort and smile when they saw the finish to their goal within site. Congrats to Eco-X for pulling off an incredible event! To the 236 finishers and 293 starters, awesome effort, it was a treat to be out there and cheer each other on. And a post about Mt. Masochist would not be complete without a mention of Dr. David Horton (I call Horton), amazing history you have made here and I am so thankful for the experiences and advice you have brought to my life.